ISLAMABAD: The working group of GB Council on Sunday approved the recommendations of the parliamentary committee and representatives of awami action committee (AAC) and Markazi Anjuman-e-Tajran (MAT) to repeal all taxes from Gilgit-Baltistan that has triggered widespread protests in Gilgit-Baltistan. The joint meeting of the working group, parliamentary committee, AAC and MAT in Islamabad approved the 3 recommendations, signed by the representatives of AAC and MAT with Parliamentary Committee in Gilgit, to end all forms of taxes from Gilgit-Baltistan. 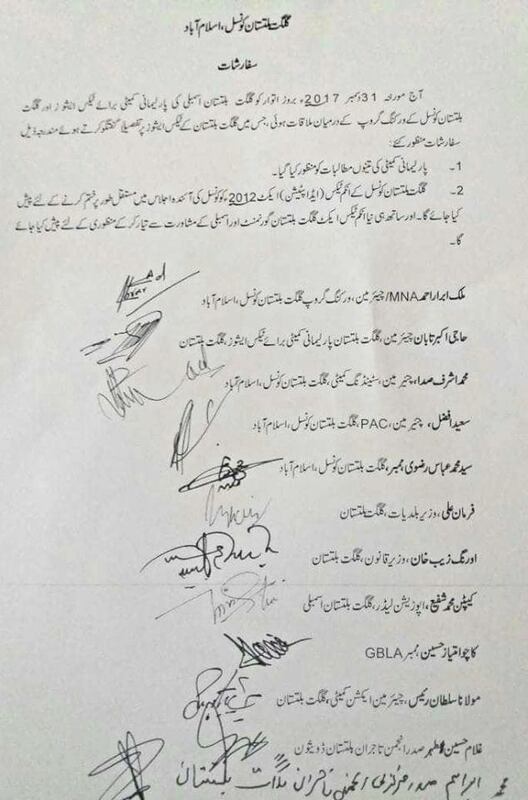 According to the signed recommendation document, the Gilgit-Batistan Tax Adaptation Act 2012 will be presented in upcoming meeting of GB Council to repeal it permanently. The new income tax act will be drafted in consultation with GB Government and GB Legislative Assembly before presenting it for approval. Gilgit-Baltistan Council had notified a 6 member working group headed by MNA Malik Ibrar Ahmed to examine and prepare recommendations to resolve the taxation issues in Gilgit-Baltistan. The working group members included two local members of GB Council Saeed Afzal and Ashraf Sada. Joint Secretary Gilgit-Baltistan Secretariat Dr. Aftab Akbar Durani, Commissioner Inland Revenue Gilgit-Baltistan Qaiser Iqbal and a member from FBR /Finance Department. It is here to mention that after widespread protests in Gilgit-Baltistan, a Parliamentary Committee formed by GB Government and the representatives of Anjuman-e-Tajran (MAJ) and Awami Action Committee (AAC) on 27th December formed a joint committee to present the agreed-upon recommendation to the GB Council on the ongoing anti-tax issue in Gilgit-Baltistan. This joint committee held meeting with the working group on Sunday and approved the recommendations for the upcoming meeting of GB Council. The Parliamentary Committee of GB Government had signed an agreement and a recommendation document with representatives of AAC and MAJ after many rounds of negotiations. Both parties had agreed to continue peaceful and symbolic sit-ins and the Skardu-Gilgit long march will be called off until the government implements the recommendations. The government had agreed to end all cases registered against the protesters. According to the recommendations, both parties had agreed to repeal the GB Tax Adaptation Act 2012 and end the income tax, bank transaction tax, withholding tax imposed under this act . The recommendations mentions that GB Council should consult Gilgit-Baltistan Legislative Assembly if any alternate law is required in this regard. The recommendations further include that amendments to be made in Gilgit-Baltistan Mineral Policy 2016 and its subject should be transferred to provincial assembly. The federal government to share all indirect taxes received from Gilgit-Baltistan with Gilgit-Baltistan government by following the pattern of Azad Kashmir, it mentions. Following this development in Gilgit, MAT and AAC had called-off the Skardu-Gilgit long march. Thousands of people from the four districts of Baltistan region had left for Gilgit on 26 December to pressurize the government to repeal all taxes imposed in Gilgit-Baltistan under Gilgit-Baltistan Adaptation Act 2012. The call for the shutter-down and protests was given by the Markazi Anjiman-i-Tajran and the Awami Action Committee (AAC) on December 21 and the move was backed by all major political and religious parties, transporters association, hotels associations, gems and minerals associations and bar associations.